DOING MORE WITH LESS SERIES - I dare you to grow! 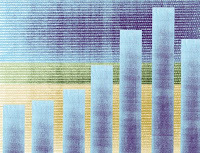 Are you happy with your company's 2008 performance? So, you've just cut 10% or more of your staff and are looking at the 2009 business plan. You remember, the one you spent 3 months getting approved beginning back in July, long before things started to self-destruct in the economy? Things have to change to get even close to the projections for the first quarter and if you stick with "business as usual", you definitely won't get where you thought you would, since your resources have been trimmed so substantially. 1. MAKE A LIST OF WHAT TO STOP DOING - Look at EVERYTHING that you do that doesn't directly serve the customer and generate revenue and see if you need to keep doing it. I talked to a woman this week who works for a hotel company in Hawaii (where visitors are down substantially) and she told her boss that she was going to have to stop producing certain reports. He said ok, then a week later came back and asked her where the report was. 2. FIGURE OUT HOW TO DELIGHT YOUR CUSTOMERS - At a time when everyone else is cutting, invest in customer service. Start by talking to your front line and ask them each for 3 ideas of how to absolutely delight the people that buy from you. Implement at least 10 ideas. 3. IDENTIFY ONE NEW MARKET FOR YOUR PRODUCT - 40 years ago someone who had a great sit down family hamburger restaurant would not have thought that it would be possible to serve their food to someone that would eat while driving. Huh? Knock a hole in the wall and put in a speaker system so they can order from their cars? The product is the same. It is just wrapped a little differently, but it is still a great hamburger. What hole do you need to knock out of your business to serve your product to a new market? 4. CARE MORE ABOUT YOUR EMPLOYEES - OK, now I've really gone off the deep end. I know. As a die-hard iconoclast, I am going to stick to my guns on this one. Your employees, and even your executives have just gone through something terrible. One round of cuts, maybe two, maybe three. Each time wondering if they were going to be next. And watching their friends lose their jobs. Watching you get rid of the really talented work horses, keeping the not-so-great, low paid 20-somethings that don't know the meaning of true work ethic and who don't really understand the customers or the marketplace. Oh, they will learn, but you really have to turn your eyes to those left behind and talk to them about how to make the work environment better. Actually items 1 and 2 will help alot and if you actually listen AND implement, then move on to item 3 together, they may actually get excited about coming to work again. If all else fails, and you need some help. Give us a call. OK, admit it. Your email box is out of control. Here it is December 30th and you are trying to decide whether to just delete the 4000+ emails that are still sitting there (or move them to a folder just in case you need something that is there) or to plow through them just to check to see if you missed something important. Here are some tips for making your email more manageable in 2009. 1. 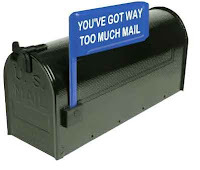 EMAIL LISTS - Take the time to get off of the mailing lists that you don't care about. This one seems obvious, but most of us just delete the messages versus taking the time to click on the Unsubscribe link at the bottom of list generated emails. While some are easier than others to get off of, it is worth the time to ensure that you don't have to deal with the same emails day after day or week after week if you don't read them. 2. PERSONAL EMAIL - If you don't have a personal email address (such as GMail or Yahoo), get one. Your business email address is the domain of your company and they have complete freedom to review anything going back and forth to that email box and if you leave the company they can elect to forward it to someone else in the company to ensure continuity in the business. Plus if you get laid off or are job hunting, it is best to have an email address where people can contact you separate from your current employer. List that personal email on Facebook, LinkedIn, Plaxo, Twitter, etc. Let your friends and relatives know that while you love hearing about their lives, that you would really like to be taken off their list for jokes and chain letters. Here is text that I recommend. Dear xxxxx, I hope you have had a great holiday season. I'm working on streamlining my life for 2009 and that includes getting control of my email. I welcome personal notes from you that help me keep in touch with what is going on in your life, but would really appreciate it if you would take me off of your mass email list for jokes and such. Here's wishing you a prosperous 2009. Stay in touch. 3. CORPORATE EMAIL ETIQUETTE - If you manage a large team or are having to do more with fewer resources, 2009 is the time to enforce better email etiquette. First of all, institute a new way to communicate via email and get your entire organization to agree on some basic tenets that will help everyone. Practice word economy - remember that many of your colleagues are reading emails on their blackberry or iphones. Pretend you are on Twitter and only have 140 characters to work with. If an email causes you to scroll down more than once, you probably should just be sending a short note asking for a phone call to discuss the situation. The TO: line is just for people that need to be actively involved in the decision or directly impacted by the information in the email. Really think before you CC: people - Finish a discussion before copying in those affected by the outcome. If you want their input, they should be in the TO: line or on a conference call. The best suggestion I've ever heard on email management came from my friend Kathy who in her communication with her staff required that each email indicate whether the originator was looking for a "nickel" answer (simply yes or no), a "quarter" answer (no more than a paragraph providing clarification or direction) or a "dollar" answer (long enough that it can't be read on a blackberry or that requires consideration and thought in reply). You can ask your team to simply include 5c/25c or $1 in the subject line, or you can use Priorities (Low, Medium and High). In order for this to work, it has to become a cultural thing within your organization that is enforced by everyone and allows you to sort your email and work it appropriately. 4. EMAIL RULES - Take time to learn how to use your email rules function within Outlook or Entourage. It will help you to sort email into sub-inboxes that will give you better control. No doubt as you look at moving into 2009, you have already cut out resources. As I said in yesterday's post, some of you have cut the fat, others have already cut into the muscle and some have truly cut to the bone, impairing your ability to maneuver normally. So the order of the day for 2009 must be to change the status quo, particularly in how you get things done. Here are 3 tips to ward off the insanity in your business that can come with trying to do more with less. Remember that insanity is defined as doing the same things and expecting different results. Today's tips center on eliminating group-think as the default way to get things done. While collaboration has its place, large meetings have become the way that people in corporate America spend their days. If they aren't in meetings, they are on interminable conference calls. You may be surprised to find out how much of the meetings are devoted to actually talking about when to schedule the next meeting. Ask yourself when exactly it is that your people get their work done? If the answer is nights and weekends, you are well on your way to burning out your remaining players before the year has even begun. Plus if in your cuts you retained the "20 and 30-somethings" because they made less, then you may find that they aren't very tolerant of the 60 hour week work ethic. So how can you do more with less? Start with Meeting Management 101. Meeting Moratorium - So step one is to declare a moratorium on meetings for one day. If you have a wry sense of humor, just post an -Out of Order- sign and watch the behavior of your people. But what we truly recommend is asking them to take one meeting-free day to find other ways to get things done more efficiently and for each of your team to come up with three ways to make money or operate more efficiently in 2009. Shorten Default Meeting Length - Moving forward, make the default meeting length just 30 minutes. Meetings and conference calls should start at a quarter after the hour and end at a quarter to the hour. If you only have 30 minutes for a meeting, it will force a new discipline of arriving on time, being prepared and focused. The other half an hour can be spend doing meeting follow up items and preparing for the next meeting. Use skilled facilitators and a formal process for multi-hour or offsite work sessions - While there is a time and a place for multi-hour work sessions, they should be professionally facilitated to ensure a firm outcome with a detailed plan for how to get the project to the next step, with specific assignments and timelines agreed to in the meeting, versus scheduling yet another meeting to get things done. Reduce the Number of People Allowed in a Meeting - Again, if you err on the wry side of life, you can just remove half the chairs from your meeting rooms and put them into storage. A better way though (although we think chair removal is still a good idea) is to ask the meeting organizer to think about who really needs to be in the meeting and who just needs to be made aware of the outcome versus being a part of the discussion. A good way to think about this is who can influence the outcome, who can change the outcome by getting the work done and who has to simply accept the outcome. The "influencers" need to be in the initial meeting. The "changers" need to put together the plan once a decision has been made, including informing the "acceptors". Corporate culture has to change moving forward to get to a place where people are enthused about coming to work and energized by the environment again. Out of that enthusiasm and energy will come profitability. As you wind down from what can only be called the most challenging year since 2001, getting ready for some rest and hopefully spending time with friends and family, I would like to plant a seed with you. There is no doubt about it. Times are hard. You have a choice as a leader in this industry. When you stand in front of an elevator, you can choose to press the Up or Down button. Today you can choose what 2009 will look like for you and your company. Conventional wisdom says, cut back. It says that decline will happen, as if you are a victim. You are going down whether or not you choose that button. building revenues and planning for growth in better times ahead is smarter. It says to invest in innovation. There is no better time. You can choose the up button for you and your firm, even if other people elect to just hunker down and play the hand that has been dealt to them by the economy. Solutionz would like to recommend a Rx for lean times that leads to growth. MOVE ON REVENUE GENERATION -- you have the products and services; now is the time to explore tools to service new markets, and determine how to do more with less. BE CAREFUL HOW DEEPLY YOU CUT - As you cut back on spending, it is inevitable that staff cutbacks will rank highly as a way to improve the bottom line. Earlier this year, many of you already cut out the fat [non-performing staff] and in the fall you began to cut into the muscle [experienced and talented staff ready to take a package]. Now you are having to look at cutting into the bone of your organization [seasoned middle managers not afraid to roll up their sleeves or worse, cutting your sales force]. Keep the "total picture" in mind when making cuts - work ethic, tenacity, experience, expertise and maturity versus pure salary. SHIFT CHANNELS - effectively choose high yielding, and variable cost channels. Recognize that this may not be your own direct channel. We can help you do the math. INCUBATE NEW IDEAS - with low risk and sustainable benefits. Getting an outside perspective can help, particularly at a time when internally morale may be low and resources may be scarce. CONSIDER ACQUISITION - As you look at how you can innovate and how you can grow, consider a merger or acquisition as a way to expand your capabilities and your reach. We specialize in assisting you in targeting partners and also in assimilating the merged entities post transaction. VISUALIZE MOMENTUM AND GROWTH - Plan only for decline and that is where you'll go. Plan for and focus on growth at the right pace and you'll be at the head of the pack - well funded, growing, and strong. When you are ready to choose growth, choose Solutionz to help. Happy Holidays. Here is the Fitzgerald year in pictures in lieu of our normal holiday letter. Really wonderful art is an excellent example of "intelligent chaos". 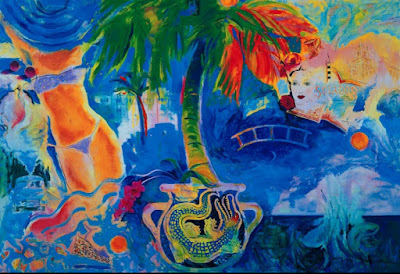 This painting by Miranda Moss is one of my favorites that depicts to me the glory of travel. Actually Miranda named this painting "Signs of Life", so it would appear that she wasn't even inspired by travel when she painted it. Another great example of intelligence coming out of chaos is when a chef takes a pantry full of ingredients that are seemingly random and unconnected and in a flurry of bowls, pans and pots, whips up a brilliant creation. When I cook, the kitchen can often be called chaotic before brilliance emerges. One of my favorite examples of intelligent chaos is a tapestry. As it is being created, a jumble of colors, including those that are not considered "beautiful" are used and if you view it from the wrong perspective (the backside), it would seem to be just a jumble of knots. But turn it around when it is finished and a beautiful picture emerges, viewable originally only in the creator's eyes. I choose to look at the travel industry right now as that jumble of knots - business models that are tired, technology that only addresses a small slice of travelers, costs that are out of whack with revenues and companies that are cutting into the bone, crippling their ability to remain competitive. Together, we can turn this chaos into intelligence. Out of chaos comes opportunity. Let's find the signs of life together. What is happening on the agency distribution front? This week ARC posted their November sales statistics. For those not familiar with ARC, it is the Airline Reporting Corporation and they report airline ticket sales through the travel agency channel (including offline and online agencies). TOTAL SALES - Total sales in November ($4,057,562,197) was down 24% from October. While we normally see a decline in sales this time of year due to seasonality, but the year over year decline in this case was 20%, which shows how significant the recession impact is on our industry. This decline impacts the airlines themselves, as the agency channel represents not only a higher yield on ticket sales due to higher ticket values, but it is also their only variable cost channel. It also impacts the agencies, due to the fact that many agencies still earn a commission or override compensation based on total sales. TOTAL TRANSACTIONS - Transactions were down in November year over year 19.68%. This trend has a direct impact on ARC themselves (as their compensation is based on transaction processing), but it also signals a direct impact on the GDS companies, as each ticket/transaction represents a multiple of approx 2.2 segments. GDS compensation is generally directly proportionate to the number of segments booked by the travel agency community (both online and offline). DOMESTIC/INTL SPLIT - ARC began reporting domestic and international sales split in 1993, at which time international only represented 24% of all sales. Since commission cuts were instituted at the turn of the century, the percentage of international over domestic has grown dramatically and in November was 45% of all sales. Agents generally earn more on international tickets, so this trend makes total sense. AVERAGE TICKET VALUE - DOMESTIC - The average ticket value in November was $327.34. This is down 5% from October, so we are finally seeing some impact of the decrease in jet fuel. In August, when the price of oil was over $140 per barrel, the average air ticket was $344.27. This is good news for the consumer, but not for an agent that gets paid a % based commission. AVERAGE TICKET VALUE - INTERNATIONAL - The average ticket value in November was $767.94, down 8% from October. The average international ticket price in August was $875.04, so we are seeing relief here as well. This is good news for the consumer, but not for an agent that gets paid a % based commission. NUMBER OF US AGENCIES - Year to date, the number of agencies is down just 2%, with a total of 17834 as of the end of November. SALES PER AGENCY - The November sales per agency is down significantly at $227,518, down 24% from October. Sales per agency has actually been growing year over year, primarily due to the consolidation in the industry (resulting agencies are larger) and also due to the growth of the online agencies. Please let me know if you have any questions on my observations. During the Great Depression, Du Pont's research team invented Nylon and Douglas Aircraft developed the revolutionary DC-3. Hewlett Packard invented the pocket calculator during the recessions of the early seventies. During the economic slowdown of the late 1990s, Apple developed the iPod and iTunes and hundreds of successful, innovation-focused firms were created. What I've learned as I prepare for my new book Bootstrap Business to be published this spring is that in difficult times, you still need to spend along the same percentages that you did in good times. What that means is that you should not shift all of your spending away from R&D, but just look across the board at spending cuts that still allow innovation to occur. It sounds like Du Pont, Douglas Aircraft, HP and Apple knew about this secret as well. What are you doing about innovation right now that will put your company "on the map" like the firms mentioned above? Double check the R&D budget line for 2009 and shift your focus to innovation. It is much more inspirational than "hunkering down". Every once in awhile, my musings take me to a place where I see just how simple everything really is. We don't need pundits to bring the basics home to us. Lately I've been helping my 10 year old daughter with her science and social studies homework (math is greatfully left to Dad). In both subjects, there are natural laws - cause and effect. They don't change. They are immutable. Laws of business and laws of the economy also are immutable and effect does follow cause. If you spend more than you make, you will lose money and eventually have to either cut your spending or go out of business. And so it goes. The cycle will continue until someone (including you) breaks it. I suggest we each do our part and not wait for the government to be our savior. I suspect they won't get to bailing me out for quite a long time, so I'd better figure out a plan now! Be prudent in spending cuts. Cut in the places where there is fat and where you don't directly touch your customers. If it takes 5 days to issue a contract to your sales people to close a new deal, cut out unnecessary processes. If you have elaborate policies that reinforce saying NO to employees or customers, see if you can retool to encourage and reward saying YES. Changing your organization to a Customer Centric Culture is a great way to grow when everyone else is cutting services. Start your analysis from the customer and move out throughout your organization. Cut from the outside in, with the customer at the center. Be creative in how you fund new initiatives. Where before you hired a team internally to get something off the ground and then expected that same team to go from build mode to caring/nurturing the business, look at bringing in outside expertise to speed up the build process. Be wise about spending both corporately and personally. Cut out the frivolous stuff (realizing that the local Starbucks may have to close at some juncture if we consider our afternoon Frappucino as frivolous), but keep the economy moving. Spend money with local, entrepreneurial businesses if you have a choice between that an national chains. The national chains will bounce back much more easily and generally have much more fat to cut before having to consider closing. And don't forget to travel so we can stimulate the industry that we serve. Stay close to home if you must, but recognize that now that gas is under $1.50 per gallon in many places, driving is a much more appealing alternative to flying. If you drive, please use www.roadescapes.com to plan and give me your feedback so we can continue to improve the product. Living in fear rarely produces a good result. Look forward to the days when you are well funded, growing, strong and an industry leader. Focus on building momentum, not hitting the brakes. Start today by making a list of 100 things you can do to grow your business. Do your part today to stimulate the economy. And if you need help, don't forget to call. So who exactly is minding the store? Yes, it is disconcerting to see the number of resumes now floating around our industry. I seem to get a new crop every week. My heart goes out to those of you who are affected by recent layoffs. Recently one of my friends had told our networking group that one of the Big x Consulting firms (does anyone know how many there are now, as we used to say Big 5, then Big 3...) was in her company on a major process analysis project and that they expected layoffs just before Christmas. What perfect timing. What are these people thinking? This used to be called down-sizing, then right-sizing. Now it seems to have deteriorated into "let's get rid of anyone that knows their stuff and gets paid a lot of money". I understand the politically correct term is now "made redundant". I'm wondering what it is about expertise and experience that is redundant? Although I know companies aren't laying off because they want to, it will eventually begin to hurt and even to debilitate. The first round cuts into the fat, the ones that weren't performing anyway. The second round begins to hit the muscle, leaving the organization limping along in many cases. I am always amazed when organizations begin cutting their sales and distribution staff. Where do they believe new revenues will come from to help them recover from this difficult time and how will they know that they are making the right changes in their distribution? 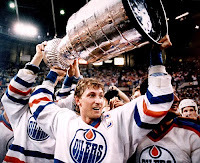 I believe that where we are now is the "cutting into the bone" time, when the workhorses that have kept the organization together in good and bad times have now been let go. This can be crippling. What will the industry look like when all the seasoned professionals have been laid off? Who exactly will get the work done after the executive teams lay out the strategy? As you are looking at your strategy for "downsizing or rightsizing", remember that the 20-somethings don't have the same work ethic as some of us older players. At 5:01pm, look around.... And that business plan that you put together for 2009? How will you accomplish everything now? Perhaps what we will see out of this is that companies will actually learn operate more leanly and with more entrepreneurial spirit, only using high level, experienced resources when they are needed versus paying payroll for certain functions 365 days a year. We will see. The only consolation is that as a consultant, business should grow as a result. I'm gathering as many of the resumes for the really talented ones and putting together a real "A Team" so that we can be ready. And remember, as a friend of mine reminded me this week "Good people are worth more in bad times." So take heart. Better times are ahead. Do you remember the movie "Waiting to Exhale"? The story line followed four women and their relationships. 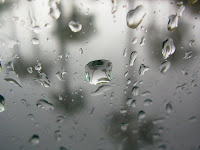 It is a rainy day in Tampa and I'm left to muse as I wait for the sunshine. As I wait, it occurs to me that many of us are doing a lot of waiting for brighter days. I'm thinking that the "waiting to exhale" in this case is an industry that is frozen in place, not making any moves for fear that the move may be the wrong one. Do I continue moving your distribution from the travel agent channel to my own web site? How can I tell the real cost/benefit of this move? Do I discount my product to try to attract more travelers? What is the long term impact and is there another way to sell my product during tough times? I've heard you talk about the drive market as an untapped opportunity. How do I reach out to the drive market (85% of all travel in US) versus the air traveler? Do I continue to provide significant supply to the online channels on merchant model? Is it time to start looking at having these channels take some risk? Do I lay off my sales staff and hope that somehow business will come to me during these tough times? What projects do I cancel now that I don't have the staff to execute my original plans? How do I prioritize? 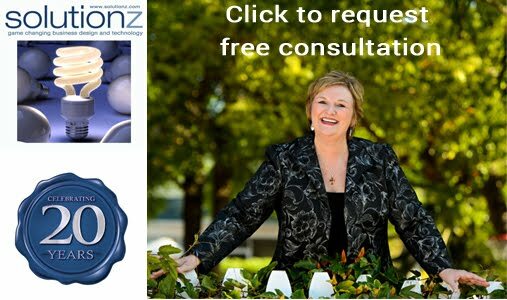 You may not know that Solutionz provides phone consultation services, in addition to traditional consulting. If you just need an hour on the phone each week to talk through the key issues and brainstorm a plan moving forward, we have a program that will meet your needs during these lean times and that will get you ready for the day that we all bask in the sunshine of a stronger economy. I have been in the travel industry since 1978. I started in a travel agency in Milwaukee WI, working for Bay Travel in the suburb of Whitefish Bay. We had a leisure agent who at the time was older than God himself and who had been everywhere and done everything. Her name was Agnes. Every time I see this cartoon by Mike Baldwin, I think of Agnes. Agnes was the quintessential travel agent. She knew how to start the dialogue from whatever worked for the client. If they knew who they were traveling with, and didn't particularly care where they went, she would drill down into what they liked to do when they were together. Note, she didn't profile them separately when they were traveling as a couple, as modern CRM and profile systems do. No, Agnes knew what they liked when they were traveling as a couple, as a family, in the summer, in the winter, when they were wanting to relax and when they were seeking adventure or just following their inbred sense of wanderlust. She knew that it wasn't always the same things. The type of hotel might change, restaurant recommendations, attractions, entertainment. Well you know. You don't always want the same thing either. But the industry and our technology has button-holed us into strict profiles. Business and Leisure if we are lucky. Beyond that, you have to wade through the options yourself and weed out what you don't want. If they wanted to drive versus fly, Agnes didn't care. She knew that she would make up the lost commission (yeah, remember when selling an airline ticket guaranteed you a 10% commission?) on booking their hotel rooms for them. She didn't use the newfangled Apollo™ computers. She felt more comfortable talking to the various travel suppliers to ensure that what they were offering was a perfect match for her clients. If they did know where they wanted to go, Agnes would help them have the best time possible there. She scoured the brochure rack (now I'm really dating myself) and would recommend things that she had done in those very places. While the term "social networking" had not yet become vogue, I suspect that Agnes was a master networker and had a card system where she could cross reference what other clients had been to the places that they were interested in. She didn't assume when they walked in the door that they wanted the cheapest thing. She didn't assume they wanted to go to Orlando, Hawaii or Las Vegas. She would handle their trips to family reunions, soccer tournaments, concerts, weddings, funerals. Agnes just wanted to help and she wanted to make sure that her customers would come back to her. And if you didn't know when you wanted to travel, Agnes was ok with that. If you knew that you wanted to travel in the spring, she'd suggest things that were good spring things. And if you said you wanted to go to a dude ranch in the winter, she wouldn't suggest Montana, but instead would find something for you in Arizona or New Mexico. And if all you knew was that you had 4 days for a trip, she'd be able to tell you what you could and couldn't reasonably accomplish in that timeframe. Best of all, when all was said and done Agnes would type (yes on an IBM Selectric™) a custom itinerary, including things that couldn't be booked, but that she knew they would want to know about. Even when she saw that Apollo™ could print an itinerary with the air, hotel and car segments, she knew that her clients needed more. I even saw her attach a map for the clients that wanted to drive. I didn't even know that AAA existed at that time, so from my own limited experience, Agnes producedthe first custom "TripTik™". Let's choose to grow. There is a lot of opportunity out there. Two days ago I wrote a blog about the decline in traffic for the OTAs. It is only fair to similarly characterize the traffic results hotel brands and online players wholly devoted to the sale of hotel rooms. 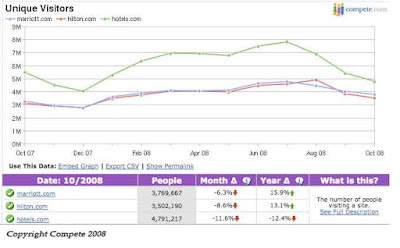 The following chart from Compete reflects the 12 month results for traffic to Marriott.com, Hilton.com and Hotels.com. The supplier and OTA patterns look similar, with hotels.com seeing a much steeper decline from their high of nearly 8m unique visitors in July to just under 5m in October. Sorry for the quality of the graphic. To view it for yourself, access the free traffic comparison service on Compete. The most important stat to note is that hotels.com is seeing a 12.4% decline year over year as of the end of October and both hotel brand sites are seeing double digit increases. All three sites saw month over month decreases for October. PhoCusWright reported in their last Online Travel Overview (seventh edition) that supplier bookings have been growing at a much faster pace than OTA bookings. Since traffic is a harbinger of booking activity, the Compete traffic reports above certainly corroborate PCW's observations. For a supplier to move business from an OTA to their own site is a smart move, as it saves commissions and switching/GDS fees. Let's just make sure that you aren't throwing the baby out with the bathwater and also discounting agency distribution. See the story below about the growth of the agency channel and the higher yields possible through agency distribution, even in light of paying commissions AND switching/GDS fees. Chicago based Travelclick recently posted 3rd quarter results for electronic bookings. The term "electronic bookings" includes bookings made via the GDS and via Pegasus, whether by a traditional travel agent or via the internet, which primarily includes OTA bookings. It excludes consumer direct bookings made via the hotelier's own internal system and excludes merchant model bookings, which are generally made via the OTA's own inventory system against a block of rooms versus live inventory access via a GDS or Pegasus. The year to date results show that bookings via the Consumer Internet channel are declining year over year at a rate much greater than their travel agent counterparts. When matched against the traffic statistics in yesterday's blog, this is not surprising. In the 2nd quarter, consumer internet room nights were down 22.7% and travel agent bookings were up 3.5%. Travel agents produced an average daily room rate $62.20 higher than consumer internet bookings, which were both up year over year. 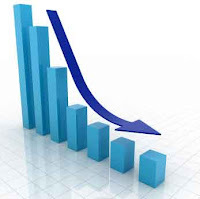 Due to the rate of the internet decline, overall revenues from the consumer internet channel were down 16.7%. Travel agent revenues were up 12.5%. In the 3rd quarter, consumer internet room night were down 36.2% and travel agent bookings declined for the first time since 2003, by .3%. Travel agents produced an average daily room rate $48.07 higher than consumer internet bookings. Consumer internet channel revenues were down 30% and travel agent revenues were up 3.5%. Now will someone please remind me why are we trying to shift business from the travel agency/GDS channel to consumer direct? 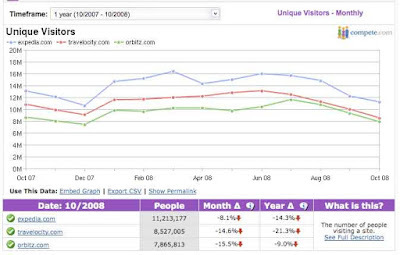 After years of growth, the online sites are all experiencing their first significant year over year decline. Various sources are reporting different statistics, but all of them are headed in the same direction - down. With the Fed now fessing up to the fact that the recession began in December of 2007, this is not surprising. Compete.com reports that in October, Expedia was down 8.1% month from September and 14.3% year over year. Travelocity is down 14.6% from September and 21.3% year over year and Orbitz is down 15.5% from September, but just 9% year over year. Compete reports on traffic, not bookings or conversions. Sorry for the quality of the above graphic. To view it for yourself, access the free traffic comparison service on Compete. For the same period, Priceline is actually up month over month at 2.1% and up year over year at 32.8%. Kayak shows a month over month decrease of 12.1% and a 8.9% increase year over year. Comscore is reporting more pessimistic numbers with Expedia coming in at a 25% decline, Travelocity 16% and Orbitz 23%, all year over year. Their stats on Priceline and Kayak show a 24% and a 93% increase year over year. The Kayak numbers are a bit suspicious, in light of the tremendous delta from the Compete numbers. Bottom line, is that October is the beginning of a normal cyclical low for the year, reflecting normal seasonality, so the month over month numbers shouldn't be seen in isolation from the year over year numbers. The year over year numbers are clearly signaling a vote of confidence for the opaque model and metasearch. The OTAs as a whole need to either hunker down and tighten their belts, or they need to search out new sources of revenue. I will hold my tongue on that one........ if you follow this blog on a regular basis, you know what I have in mind. This year was the 30 year birthday of the GDS industry. Didn't get invited to the party? You are not alone. There was little or no fanfare to celebrate this industry milestone. I will do my part in the celebration by offering a spectacular discount on my Travel Distribution Library. This set was originally published in 2002. The first book is on the history of these "E-Commerce Pioneers". The second book was a snapshot in 2002 of the then 4 GDS companies and their international counterparts. The third book is the Essential Guide to Multi-Channel Distribution and most of these premises remain timeless. Originally $2395, I will offer the readers of my blog $2000 off, or a total price of $395 for the set of 3 books in this closeout sale. If you have people in your company that have recently joined the industry, this set is highly recommended. And yes, I'm trying to clear the shelves for my new book - Bootstrap Business, coming out this spring. 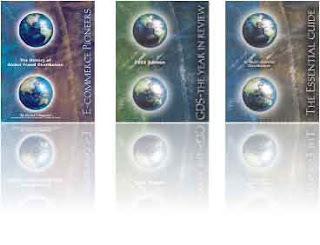 Just go to the Solutionz website to get details on each title and when you order, select BLOG in the discount box.And if I can get the 3 GDS companies to provide updated stats, there may be a 30th anniversary edition of the ECommerce Pioneers book. We'll wait and see on that one! Be patient while the video buffers, once you hit the play button!! As I mentioned, VFR (visiting friends and relatives) travel is at its highest in November and December. If you are reading this from grandmas, then you will understand the over the river and through the woods title. Reaching this market is key to achieving growth in this very large sector. Over 26% of all travel in the US is VFR travel. While this has traditionally been seen as a group that does not stay in hotels, with the right tools, that can change. Check us out at www.roadescapes.com. And enjoy the leftover turkey and pumpkin pie! This week, Hendersonville TN based Smith Travel Research posted October 2008 results for the hospitality industry. No surprise that all three key performance measurements showed a decline, including the first year-over-year decline in ADR (average daily room rate) in more than five years. This indicates that hoteliers are bending under the pressure of lower occupancy and trying to recover by discounting. This is a slippery slope. Year to date, we are seeing a 3.4% decline in occupancy, with a 6.5% decline year-over-year for the month of October. This is not surprising since air travel frequency and capacity in most cities is seeing a 15-20% decline. The fourth quarter is traditionally one of the worst quarters in travel, largely due to the fact that the two major holidays in November and December are the "over the river and through the woods" kinds of vacations - by car and a large amount of friends and family visits, versus vacations. Great week, albeit long. Reconnected with lots of old friends and met some new ones along the way. I'll resume my musings about distribution on Monday. I was just going through my mail at the end of a very long, terrific day at PhoCusWright. Over 1000 attendees, despite the grim economy. TONS of new players. I missed the innovation day yesterday. My mail contained the list of finalists in the Center Stage 5 minutes of fame contest, culled down from the over 30 presenters. Last year my technology firm, LeisureLogix won the 5 minutes of fame for our RoadTrip Wizard product (now known as RoadEscapes.com). Some would say (and for those that follow my former partner Timothy's blog, he did say...) that we were a flash in the pan and way off the radar. I saw this video today and was not only inspired. I look forward to the day that our company name is inserted in an updated version!! Go for it! You can't win sitting on the bench. I've been in this industry for 30 years, so nothing should surprise me. But this morning, I am downright angry at Delta. Perhaps it is unfair to single them out, because I suspect that others have policies that are just as insane, but nevertheless I feel honor bound to rant this morning and this is just enough to get me to switch airlines, just on principle. I had used SkyMiles to buy my ticket to PhoCusWright next week. So far so good. Then I had to rearrange my schedule to go to a meeting in Chicago on Monday. I saw that DL was going to charge me $100 to redeposit my SkyMiles and then over $200 to purchase a new ticket using SkyMiles (I won't even get into why this is SO wrong on so many levels). Anyway, since I wasn't sure at the time that the flights that I needed would even be available for the number of SkyMiles I have left, I made the decision to go ahead and buy the TPA/ORD/LAX ticket and then just use the return from the SkyMiles ticket. Silly me...... I've known about Delta's "married segment" rule for well over 10 years, so I cannot account for my lapse of memory at that given moment. For those of you that don't understand that little rule, if I had not shown up for the 7am flight on Monday to LA, they would have cancelled my return, EVEN though I purchased a $600 ticket to replace the "FREE" (well not so free as you will see) segment. So today I called, just to cancel the outbound on the SkyMiles ticket, as I wouldn't be needing it. And you guessed it, they are charging me $100 for NOT using that segment. Nevermind, I already paid $100 for redeeming my SkyMiles which were originally intended to allow me to travel FREE..... argh. So for those of you who haven't seen the original "If Airlines Sold Paint" story, here it is. It has actually gotten much more absurd than Alan's original 1998 version, but here it is. Customer: Hi, how much is your interior flat latex paint in Bone White? which is $22 a gallon. How many gallons would you like? Customer: I'll take five gallons of the medium quality, please. Clerk: That will be $80 plus tax. Customer:  Hi, how much is your paint? Clerk:  Well, sir, that all depends. Clerk:  Actually a lot of things. Customer:  How about giving me an average price? gallon, and we have 150 different prices up to $200 a gallon. Customer:  What's the difference in the paint? Clerk:  Oh, there isn't any difference; it's all the same paint. Customer:  Well, then, I'd like some of that $9 paint. Customer:  I want to paint tomorrow, on my day off. Clerk:  Sir, the paint for tomorrow is the $200 paint. Customer:  You've got to be kidding! have shelves full of that stuff; I can see it right there. any given week. Oh, and by the way, the price just went to $12. Customer:  You mean the price went up while we were talking? purchase. How many gallons do you want? buy six gallons just to make sure I have enough. confiscation of the paint you already have. before you do the bedroom, you will violation of our tariffs. Customer:  But what does it mater to your whether I use all the paint? I already paid for it! when you don't, it just causes us all kinds of problems. I don't keep painting until after Saturday night! Clerk:  Yes, sir, it will. Clerk:  That won't do you any good, sir. We all have the same rules. Traveling by car is looking better and better and better....... if LA weren't so far away, I'd do it in a heartbeat, particularly with gas nearing $2 per gallon. Gas prices down and the stock market up - this is good! Last night as I was watching the evening news, I was frankly startled to see oil prices down in the $50 range. 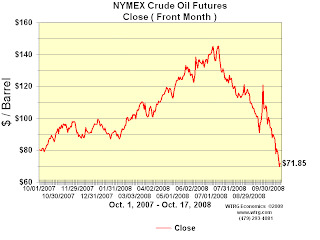 In fact today, it closed at $58.24 per barrel, which is the lowest we have seen since January 2007. The stock market had a wild ride today. The Dow dropped briefly below 8,000 — falling more than 300 points — to retest lows that it hit Oct. 10 before a sharp climb into positive territory. The Standard & Poor's 500 index dropped to 818.69 before staging its own strong rally. The Dow closed up 6.67% at 8,835 and the S&P closed up 6.92%. Once again, we are seeing the benefits of low crude prices at the gas pump (as low as $1.50 per gallon in Houston), but so far, not seeing the benefits flowing through to our air tickets prices. In fact, in ARC's latest monthly sales report, domestic air ticket prices were up 10% on average to $342.61, versus $310.15 in September. United stock closed up 17.9% today. Delta was up 10.85% and Continental was up 8.62%. So Mr. Airline CEO, whats up? It is a simple question really. There has to be a way. The title for this blog was inspired by an article with a similar title published by Forrester today - How To Increase Grocery Sales In A Grim Economy. But the conclusion of my analysis couldn't be farther from the Forrester conclusion. Author Bracewell-Lewis wrote that "Grocers Must Target Price-Sensitive, High-Spending Online Grocery Shoppers" and that they should essentially discount their products to stimulate sales. In fact, she said "Grocers should reposition themselves as discounters on the Net — as Tesco has done — to directly compete with discounters that do not sell online." The travel industry [and travel suppliers in particular] have been doing this for a decade now and personally, I do not think that discounting is the answer. In fact, I couldn't disagree more. Let's revisit the T-Myths that I wrote about last week, as I believe the answer is staring us squarely in the face. For 10 years, online travel retailers (and suppliers alike) have been catering to the air traveler. Air travelers account for just 15% of all trips annually and 22% of all travel spending in the US. It is time to shift our focus to the drive market, which represents the other 85% of all trips and the other 78% of all spending. Our technologies and tools only deal effectively with point to point travel and generally only work when the consumer knows precisely WHERE and WHEN they want to travel. Although 11 of 20 consumers using search engines in the travel category are searching for maps and driving directions, the bulk of travel technologies do not include mapping and routing amongst their services or if they do, it is just the point to point variety offered by MapQuest or Google. The drive market needs integrated travel search and booking, as well as mapping and navigation and they need local content, such as restaurants and shopping, the top two activities for travelers. This information, if provided, is generally narrative information, versus being able to add these points of interest into a trip/itinerary. We've gotten away with generic delivery of information about available inventory (e.g. hotels and cars) and basic profiles which show vendor preference and not much more. Our CRM systems are one dimensional and only reflect projected behavior under a single scenario. But as humans, our choices change based on WHO we are with and WHAT we like to do under various scenarios or based on our intent or even HOW we are traveling. Even Google has desensitized us to our need for relevant content. Why would we accept 543,000 entries for restaurants in Tampa, when all we really are interested in are Indian and Thai restaurants? It is time for a change. We can't behave the way we used to behave in better times. Less people are flying, more people are driving. We need tools and sales approaches geared to the large, unserved market. If I am beginning to sound like a broken record, it is because it is frustrating to hear the level of anxiety about our current state of affairs when there is something that can be done about it. I was reading in a book last night (the Divine Mentor) that one of the greatest maladies is the phenomenon of living inconsistently with what we believe or said another way, living inconsistently with truth [otherwise known as incongruence] is one of the foremost causes of anxiety. The truth is that there is a market out there that we as an industry are not adequately serving. It will take some effort and some investment to serve it properly. But to throw our hands up and accept the status quo as truth, will only result in further anxiety and angst. Let's solve the problem together. With the economy as a clear priority of the new administration, the world markets reacted to the election of Barack Obama, with investors voting with their wallets. In Asia, the Nikkei, the major index for the Tokyo Stock Exchange, closed up 4.5%. South Korea's Kospi composite index finished with a 2.4% advance, according to Dow Jones. The Hang Seng index in Hong Kong ended up 3.7%. The Australian All Ordinaries index was up almost 3% at its close and the markets in Taiwan and the Philippines ended lower. European stocks and U.S. futures fell after Democrat Barack Obama was projected to have been elected President of the United States. London's FT-100 and Paris' CAC-40 eeach fell more than 2%, while Germany's Dax was about 1.5% lower. It remains to be seen how the markets will close today in Europe and how the US markets will react. But it is the longer term results that will matter. In the Obama camp, optimism is the order of the day, but it will still be over two months before he will be able to personally impact the economy through the implementation of his various programs. But the behind the scenes work will begin now. First with the formation of his cabinet and firming up various key appointments so that he can hit the ground running on January 20th. We wait with bated breath, particularly interested to see the plans for strengthening air transportation in underserved areas at the very same time that airlines are reducing capacity and frequency and outright eliminating service to a number of cities in our great land. Is the reported "airline recovery" just the upside of the jetfuel roller coaster? In an article in the Financial Times yesterday, Justin Baer reports that the "US Airlines pull out of a tailspin". Airlines are indeed enjoying much lower fuel costs than they did in the summer of 2008. Perhaps the use of the word "enjoy" and the notion that recovery is around the corner is a bit like a weatherman in the middle of a hurricane talking about tomorrow's sunshine. At least that was the observation of a writer in Airline Weekly this week. When the prices were high, the airlines kicked into high gear, cutting costs, trimming schedules, parking aircraft in the desert and finding ways to charge passengers for various services, previously offered gratis. Now that the prices are low (remembering that everything is relative), will they hand off a slice of those profits to consumer? Not likely! And what will be the impact on the other sectors of the industry? The GDS companies depend on airline ticket sales for 90% of their revenues. And the hospitality industry also caters to the air traveler as their primary market. What will become of them? It is an interesting conundrum that must face airline executives at this juncture. The dire situation that they found themselves in this summer has subsided. They reacted, adjusted and are now even predicting profits in early 2009. So what do they do now? How will they be seen by their peers and by the press and by their customers? To Wall Street and their Board, they no doubt will be heroes. Perhaps the chief executives will even be dubbed "turn around artists" and awarded bonuses, much to the chagrin of furloughed employees. They will take a significant amount of criticism from the press and perhaps even be accused of greed as they pocket the difference in the fuel prices of the summer and now, versus handing it to the consumers as has happened at the pump. To the consumers, well, it is a mixed bag of reactions. For the business traveler, it is nice to have empty center seats on their frequent trips. Frequent travelers have adjusted their packing habits to reduce the need for checking extra bags for a fee, they have figured out that they can buy a bottle of water in the airport versus paying $5 on board for the precious H20 and most of them have received a pair or two of high quality noise-canceling headphones on a birthday or on Christmas, so they aren't having to pay to listen to the audio or a movie. For the leisure travelers, perhaps they aren't flying as much due to the high fares and enjoying family time in the car instead. I loved the quote from Michael E Levine, a former airlines executive who teaches at New York University's School of Law, in the Financial Times article that cautioned that carriers need to tread carefully even as they benefit from the rapid descent in fuel costs. Mr Levine points out that it is paying passengers, and not cheap fuel or brand-new efficient aircraft, that shape an airline's fate. Can you say amen to that? At the end of the day, if the airlines remain with the status quo, we will have fewer flights, translating into fewer seats for sale, online and offline. The GDSs will suffer a decline in bookings, travel agencies will see (and in fact have already seen) a decline in tickets issued and hotels and restaurants will have fewer guests. As I mentioned a few days ago, ARC is already reporting double digit declines in agency ticketing in October. And of course as we wait for consumer confidence to be restored, we keep one eye on the price of a barrel of oil, as who is to say what will happen to it moving forward? In the meantime, is the onus is on the airlines to play their proper role in stimulating the economy by lowering prices? Would you if you were in their shoes? If we are in fact just on the upside of the jet fuel roller coaster ride and another downturn (in the form of higher oil prices) is around the bend, then perhaps they are wise about banking the profits and storing up for a rainy day. The Travel Economy - Poised to bounce back? Yesterday morning I was listening to a program where a Houston preacher was talking about how various trees react when subjected to hurricane force winds. While he was taking about our character and nature as it relates to the trees, it occurred to me there is also a very strong parallel to the economy. In his sermon he talked first about the mighty oak. While it stands very talk and looks very solid, when category 3 winds come, amazingly, they break in pieces, causing damage in their wake. I would observe that the major financial institutions, AIG, Lehman Brothers and many of the banks are like the mighty oak. Who would have ever thought that when the winds of the credit crisis blew, that these companies would break into pieces, needing rescue instead of providing shade and shelter in the storm? The second tree was the pine. No matter how tall the pine tree, the fact is that it does have very shallow root systems and when the winds blow, they are often the first to fall, also damaging anything in its path. The mortgage companies that spearheaded sub-prime mortgages, allowing the American public to leverage themselves beyond reason, are like the pines. It isn't difficult to imagine that these would be the first to fall and we have seen the damage left in this particular storm's wake. Our industry, the travel industry, is much more like the stout palm. While the winds of economic crisis are clearly blowing, like the palm, we bend and it may even seem like we will never recover from the effects of the storm. But our industry is resilient, in fact incredibly so. No matter how hard and how long the winds blow, we bounce back. We adjust, we maintain a spirit of hope that when the winds stop blowing we will actually emerge stronger. And this hope is well founded. The root system of the palm is actually strengthened as the tree is bent by the punishing winds. While consumer spending and consumer confidence are suffering, for most, consumers don't see travel as a luxury, but as a birthright. So while they may put off buying a new car, opting for driving their current one a bit longer, or they may choose not to buy a new couch or to get the latest video or audio toys, when their vacation time rolls around, they may do something less exotic, stay closer to home, or drive versus fly, but they won't cancel their time off. While we are bent by the winds, we need to focus on strengthen our root systems - retooling our plans, adjusting our cost structure, refocusing our efforts beyond the storm, looking for growth opportunities once the sun begins to shine again, as it inevitably will. It is important to note that even a palm can break and topple if it behaves like an oak or a pine. On the distribution front, if you are inflexible, holding on to the way you have always done things, you may not weather the storm. If your roots do not go deep and you ignore the basics (understanding the benefits of a variable cost channel versus shifting everything to a fixed cost base, or embracing channels that yield significantly lower profits where the delta between the two is higher than the cost of the external channel), you will topple like the pine. Leadership matters. How would you characterize your leadership style? Customer attitudes are important. If you hold fast to rules and regulations and are not sensitive to your customers, you will break like the oak no matter how strong your brand has been in the past. If you give lip service to the customer and end up nickel and diming them to death, then you too will topple like the pine. Customer intimacy is important. Measure yourself against the type of tree that you resemble in your attitudes on the front line. As I sit here on a glorious Monday morning in Tampa, I am so glad that I'm surrounded by palm trees, even though as of Saturday another hurricane season has come and gone. I patiently await the passing of this economic storm as well. Meanwhile, if you have a chance to invest in an oak, a pine or a palm, I'd go for the palm every time. T-Myths™ Are the myths just about online travel? Recently, PhoCusWright published a press release that talked about their most recent consumer research debunking six online travel myths. As usual, PhoCusWright nailed the issues right on the head and have backed them up with research. But I firmly believe that the myths that we need to break down are actually at a much higher level than just online travel. And rather than rounding up the usual suspects for online surveys (the air traveler), we need to open up our world to include the broader spectrum of travelers. Few are aware that with online travel ecommerce at $137b, that still just represents 18.5% of total US travel spending. TIA reports that travel spending is at $740b. Since travel agents represent $129b of that spending, there is still a tremendous market opportunity, irrespective of what channel and what model is used. In fact a $474b market by my calculations! Tapping into true growth opportunities at this juncture requires that we break down the three top myths plaguing this industry. It won't happen just by wishing it were so. At Solutionz, we call them T-Myths™ and irrespective of what channel consumers use, it is imperative that we as an industry break them and find ways to tap into the incredible upside that still exists in what we call the "real" mass market. 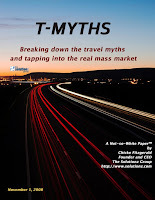 We address this in our latest "Not-So-White" paper series on the Drive Market, which on November 1st is being updated and republished under the title "T-Myths - Breaking down the travel myths and tapping into the real mass market". We will be addressing each of these in an upcoming T-Myth blog series. Stay tuned, as Solutionz is also crafting a special version of our RapidStrategy™ workshop to help companies explore and capitalize on this growth opportunity. "I don't skate to where the puck is, I skate to where the puck will be." In the travel industry we've been living fat, dumb and happy for the past 30 years, relying on the foundation established by the GDSs in 1978 - selling the core products: air, car and hotel and also extensions, tour, cruise, insurance and attractions. The primary market has been the business air traveler and the vacation traveler who primarily travels by air. Suppliers have been moving away from traditional distribution channels with what can almost be called religious fervor, making disintermediation an art form to be publicly lauded. Strange thing about both of these trends, is that they are incredibly short sighted. They are "skating to where the puck is". I believe that "skating to where the puck will be" entails a thorough evaluation of the whole market opportunity for product and service sales and that if a traditional channel is variable cost AND high margin, that moving away from it on purpose is just plain insanity. Building value, differentiation and profitability in the multiple channels (click, walk, talk, beep) where consumers live is the holy grail. That is the true art form that we should be seeking to master. Belated announcement - Never to late to tout success! If you haven't checked out our journey planning tool lately, please see what it is possible to accomplish with nothing but sheer entrepreneurial grit and determination! Smith Travel Research reported today that the US Hotel Industry posted declines in two key performance measurements for this past week. Occupancy fell 7.3% to 64.2% and the revenue per available room fell 7.1% to close at $69.76. The average daily room rate stayed fairly steady at a .1% increase to $108.61. The airport property decline is consistent with what we've been seeing on the airline capacity and frequency fronts, so this confirms that the hotel sector will not be immune to the cuts. Across the board results however seem to be between 4 and 6% lower than the capacity cuts themselves. We can only hope that after the election, the media hype about the economy will subsid somewhat (please tell me that it will.....) and that then consumers and corporations will not be as fearful about spending, particularly on travel. I am always curious as to how much of a recession in this media saturated world is stimulated by the fear that they engender. I'm ready for a new topic. How about you? Yesterday in my post, I talked about the year to date ARC statistics from the perspective of the average airfare being up both domestically and internationally. Which, as I stated, was good news for the airlines, but not so good for consumers (unless you fancy that empty center seat that has been popping up more and more over the last few weeks). Today I learned that on an airline transaction basis (the total documents processed via ARC), the first two weeks of October are down 13% year over year. So this is not just seasonality kicking in. This is the first signs of the magnitude of the 4th quarter cutbacks. 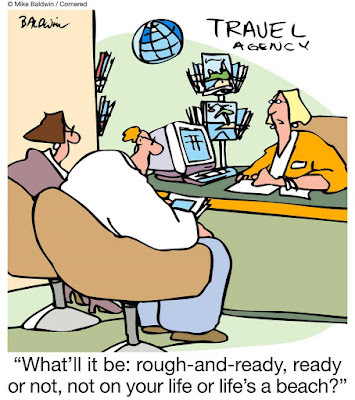 According to my source at ARC, they are generally seeing 30 days from ticketing to travel, which sounds a bit long to me, but I will take them at their word as they are squarely in the data analysis business (lest you think they are purely a clearing house). So November schedules are already well into the double digits as it relates to capacity and frequency reduction. I suspect we will see the trickle down impact of this with the GDSs as well for their 4th quarter booking numbers. Hmmmmmm...... time to figure out how to stimulate spending. Let me ponder that one for tomorrow. $71 per barrel for crude - What will it change? Despite what should have been the busiest travel season of the year, last week Southwest Airlines reported its first quarterly loss in 17 years. Continental and Delta also reported losses, citing high summer fuel costs as the chief culprit. When the fuel costs hit $140 per barrel this summer, most US airline executives kicked into high gear, cutting capacity and frequency, paring costs and boosting revenues by increasing prices and adding as many fees as they thought the traveling public would bear, but as 3rd quarter results are now reflecting, the efforts to cut costs and augment revenues was not enough to offset the unprecedented cost of fuel. On Friday, the price of crude oil futures fell to $71.85, well below the price one year ago and nearly 50% lower than the historic high this summer. No one can dispute that airlines will benefit from lower crude oil futures, but what will the travel industry as a whole see in the near term from this sharp drop? We should as an industry be celebrating, but I don’t hear any cheers or even a sense of optimism peeking through from the usual pundits. It is important to understand that out of every barrel of oil (which apparently holds just under 45 gallons), 22.6 gallons goes to gasoline and just 5.5 gallons goes to jet fuel, with the balance going to asphalt, home fuel oil and other products such as lubricants and various gasses. So who benefits most from the drop in price? Will it follow this same distribution formula? Will the airlines actually reap the kind of benefits shown in the chart above as it relates to their costs? Perhaps not quite as starkly as the chart shows, but they should definitely see lower costs than they did this summer. And will passengers see a corresponding drop in fares? I suspect not. Actually I will be more definitive here, lest you see my statement as pure opinion. Per ARC, year to date, airfares are up 10% domestically from last year’s average of $310.15 to $343.68 at the end of September. And internationally, the ARC ticket average for international tickets is up 7% from $799.22 at the end of 2007 to $854.12. It is safe to say that the crude oil price drop has already been most readily visible at the pump. I hadn’t been paying attention to the price of crude oil since I published my white paper on the drive market, and so this weekend when I actually saw gas below $3/gal in Florida I thought it was a mistake. Will we see even lower gas prices and more people driving that used to fly? If what I saw at the gas pumps this weekend holds true and airline prices stay as high as they have been, then most assuredly so. This reinforces to me that my unrelenting pursuit of the drive market is on target. This market already represents 85% of all travel in the US and as a market segment should just get larger and stronger over time. If you are interested in seeing how your business can benefit from this largely untapped market, please see my white paper on the drive market and check out the syndicated market study that the Solutionz Group and Mandala Research are fielding this fall (see story below). I believe that this is a time to pursue revenue growth. We can't save our way to prosperity. Economic Downturn - Where do we go from here? The economic news is bad. The losses are real. The Dow is swinging wildly. People are hurting. The government is having to be the financial sector's white knight. But watch and wait. It always comes. As sure as day follows night, and summer follows winter, economic downturns are followed by recovery. Job #1 during a downturn is to smartly prepare for recovery. The good news is that Travel and Tourism rebounds more quickly than the general economy. The fundamental behind this is that people see travel as a right, not a priviledge. And while people may stay closer to home or take less exotic trips, they generally don't cancel their vacation altogether. So be patient. Plan. 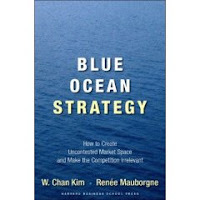 Retool for growth and focus on the customer. While the economic downturn in 1992 and the period following 9/11 brought dire results, as shown in the following diagrams, the rebound of the world travel economy was swift and strong and worldwide employment came back stronger than before. 2007 saw continued broad-based strength in the Travel & Tourism economy, although generally below 2006's dynamic growth rates. Growth of just over 4% was in fact achieved. The World Travel and Tourism Council and its counterpart organizations are optimistic, yet at the same time realistic. In 2008, growth is expected to slow to 3% but this expansion is still healthy given the difficult economic environment. Tourism's contribution to global economic activity and employment is expected to continue increasing over the coming ten years. According to the World Travel and Tourism Council, real GDP growth for the Travel & Tourism economy is expected to be 3.0% in 2008, down from 4.1% in 2007, but to average 4.0% per annum over the coming 10 years. The US government's investment in our banks, announced this morning, should help to restore stability to the banking system and to stimulate our economy. Let's share the WTTC's optimism and prepare for growth. Take advantage of a little downtime for planning. You can't ever go wrong by focusing on the customer at a time like this. Solutionz and Mandala Research have teamed up to leverage the Solutionz Group's strong distribution expertise and Mandala's deep experience evaluating consumer behavior. Watch for this new research report in early 2009, which will provide a comprehensive picture of the drive market from both the consumer perspective and from the travel industry's viewpoint. The drive market represents 85% of the 1b overnight trips and 78% of all travel spending ($495b) in the US, according to the Travel Industry Association. Keep your eyes open for the official press release about this new partnership. IS EXECUTION ENOUGH TO FUEL INNOVATION? Comment on Timothy O'Neil-Dunne's article on "Technology is great, but it's the how that matters"
In a recent article in 4Hoteliers.com, Timothy O'Neil-Dunne (who incidentally is my former partner, and knows me quite well) made the following observation, focusing on how we frequently fall in love with technology, yet "see it parked on a shelf". He segued from a discussion about smart phones, Blackberry, the iPod, right into the following comment. For example, at the 2007 PhoCuswright Conference, arguably one of these places where the arbiters of what’s cool in Travel Technology hang out, the winner of the 5-minute pitch was a company called LeisureLogix. Great idea, lousy execution and zero sales. They quietly sank beneath the waves. Timothy, Timothy, Timothy - It is beneath the waves where the power builds up....... Keep your eyes open. True innovation doesn't happen overnight. Rip tides can be terribly deceiving and hidden under churning waters. I actually loved the segue between the iPhone and our Journey Planning product. I frequently use that in our pitch to investors. Our journey planning tool takes trip planning/booking, location based content and mapping/navigation and knits them together, much in the way that iPhone knits together personal assistant technology (phone book, calendar, to do lists), a camera, a music device and a GPS. What has previously been a very fragmented experience (planning a trip by car) is now a much easier task with RoadEscapes.com. I will say that I guardedly agree with you about having technology see the light of day all being about execution. By the way, it is very easy for companies like Apple and Rim to innovate AND to execute. Deep pockets have a way of smoothing that over and shortening development to market cycles. Try doing that with your own life savings and talking angel investors into backing your dream before you can even demonstrate a product, or getting someone like Travelocity to sign an agreement to put the product on their site before you have written a single line of code. Paying payroll with Master Card and Visa, borrowing against your life insurance and working without a salary for two years have a way of ferreting out how serious you are about innovation. Remember the old adage "put your money where your mouth is"? I've been living that! And I'm in very good company. Patrick Grady of Rearden Commerce at the recent Beat Live conference in Cleveland talked about how he paid payroll with his savings until Rearden got to the place where they could raise significant external capital. I will venture an educated guess that it took Patrick longer than 2 years to achieve his vision, since he began his journey in 2000 during similarly challenging financial times. So I actually feel very blessed Timothy to be where LeisureLogix is right now. We did, quite wisely I might add, ramp down earlier this year when the original business model didn't match our expectations. That is what smart entrepreneurs do when their own funds are on the line for their dream. I have the incredible good fortune to have a patient angel investor and a very loyal group of supporters who have in large part donated their time (in exchange for equity of course) to keep the product moving forward and the company alive. 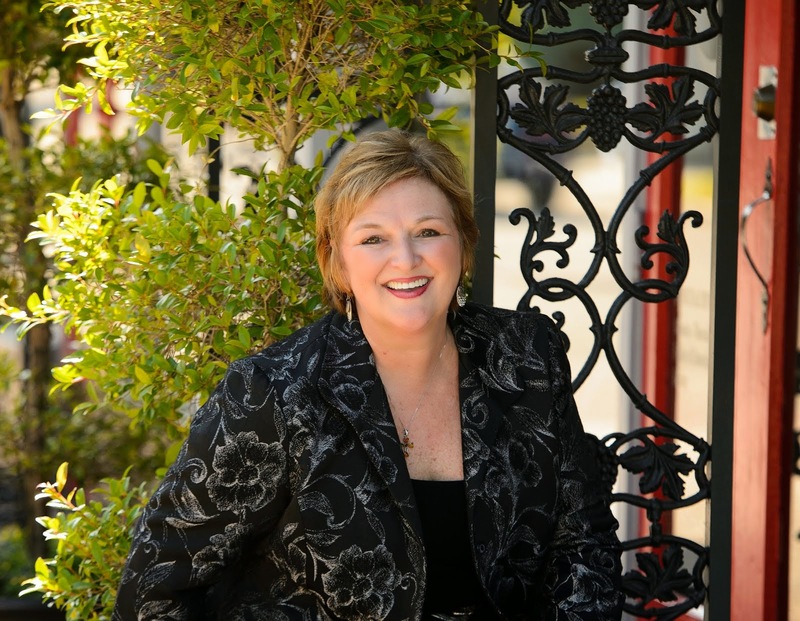 I also am blessed to have 12 years of business growth consulting experience (4 glorious years with you as my partner I might add.....), and am now applying that business incubation expertise to LeisureLogix, with the help of Solutionz Managing Partner and co-owner, Annette Hogan, who is acting as the CMO of LeisureLogix and Kit Cox, doing the work of what seems like 20 people right now, who you will remember from when you and I helped to build LasVegas.com, also in very challenging economic times, in 2002/2003. Bottom line is that the product was and is still on target in getting this industry out of what I believe to be a broken metaphor - WHERE are you going and WHEN and a total focus on price. This dialogue, whether online or in a traditional travel agency environment only suits an air traveler, which in this country only includes 15% of all travel. 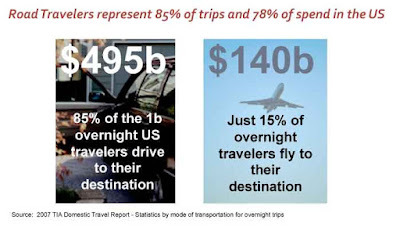 85% of all travelers drive. And check out the balance of spending, all the while remembering that the top Private Equity firms in this industry (TPG, Silverlake, Blackstone, BC and Cinven) have invested over $16 BILLION in the 15% piece of the pie that produces just $140b in annual spending. According to TIA, the drive market represents 78% of all spending on travel in this country. And online travel and even the tradtional travel community have not even scratched the surface on the spending in the drive category. PhoCusWright cites that online travel is at $137b and offline travel agency revenues are just over $129b. Do the math. There is still a LOT of opportunity to tap and at LeisureLogix we have our sights squarely on the bigger pie. With LeisureLogix' award winning RoadEscapes.com product (by the way, we recently were awarded the new online travel category Silver award from Travel Weekly) we have introduced not only a tool for the drive market, but we've overhauled travel search to allow you to begin planning from WHO you are traveling with, WHAT you like to do (irrespective of WHERE you are going) and HOW you are traveling. We've even broadened the WHERE and WHEN metaphors. And we have introduced a multi-dimensional, multi-faceted "persona" known as the electronic twin or eTwin™ that allows you to actually get cross-category, relevant results when you enter a phrase or a keyword. We have spent the last 9 months regrouping in incubation mode, but you of all people, know me well enough to know that we are definitely not out. The product is alive and well at www.roadescapes.com. We just did a soft launch of this site in September as we further refine our new model and some very exciting and totally unique capabilities. We have raised $6m to date and are not done by any stretch of the imagination! AND we are very patient. The news of our demise is greatly overstated. I bought a book last night in the airport, published by the Harvard Business School Press in a new series titled "Lessons Learned" that quotes Brent Hoberman, co-founder of LastMinute.com as saying "Entrepreneurs must be tenacious. They should never take no for an answer." That is my mantra. Thanks for remind us how important execution is Timothy. I do agree wholeheartedly, but don't forget that investment and risk are also essential elements and that with the $16b investment in the GDS industry by the Private Equity players we are still in a "sea of same". I may be "quietly beneath the waves" right now Timothy but make no mistake, it is under the Blue Ocean and I am happy to ride this out and harness the power of the rip tide. (to read Timothy's original article - please click here) Your comments welcome!